The global OSS BSS system and platform market is poised for strong growth in the coming years, driven mainly by the expansive telecommunication sector. The rising adoption of convergent billing systems and the growing demand for customer care services are also anticipated to significantly contribute to the OSS BSS system and platform market. The opportunity presented by this market was pegged at US$29.11 bn in 2015 and is slated to advance at a CAGR of 10.5% from 2016 to 2024, to attain a market size of US$70.97 bn by the end of the forecast period. Curbing the widespread adoption of OSS BSS systems and platforms are regulatory issues and difficulties in integrating them with existing systems. However, the roll-out of the new-generation operation systems and software (NGOSS) framework is expected to provide immense potential for growth to the players of OSS BSS system and platform market. Within the OSS market, the service assurance segment is expected to dominate the global market by 2024, followed by the service fulfillment solutions segment. The dominance of these services is attributed to the surging demand for consistent high-speed connectivity in Europe and North America. Moreover, several telecommunication regulators across the globe have formulated certain standards to comply with quality of service (QoS), which further propels these two segments. The network monitoring and network designing segments, on the other hand, have been witnessing a rise in demand across the Asia Pacific, Middle East and Africa, and South America regions. This demand is attributed to escalating communications infrastructure across developing regions. The roll-out of augmented networks in Asia Pacific is expected to further propel the OSS market to expand at a strong CAGR of 10.7% from 2016 to 2024. The BSS market was primarily led by the customer management solutions segment in 2015. However, revenue management is expected to surpass the market share of customer management solutions by the end of the forecast period. This development is mainly attributed to a decreasing average revenue per user (ARPU) and growing investments in communication infrastructures across major developing countries. North America was identified as the leading OSS BSS system and platform market, holding approximately one-third of the global market revenue in 2015. The growing number of telecom providers and mobile network operators in North America is seen as the prime factor driving the demand for OSS BSS solutions. In North America, the industrial scenario is mainly adjudged by the overall growth in the telecom and IT domain. Furthermore, favorable government regulations have strengthened the North America OSS BSS system and platform market. Asia Pacific is expected to witness high growth in terms of revenue during the forecast period owing to factors such as the rising demand for mobile internet, the falling ARPU for voice, intense competition, and an increased degree of convergence, necessitating the need for operational efficiency and innovation. The growing number of subscribers and the rising demand for augmented services such as revenue and billing management have raised the prospects for OSS/BSS systems and platforms across the European telecommunication sector. Leading players in the global OSS BSS system and platform market include Accenture Plc, Telefonaktiebolaget LM Ericsson, IBM Corporation, Amdocs Ltd., Tata Consultancy Services Limited, CSG Systems International, Inc., Oracle Corporation, and Hewlett-Packard Company. 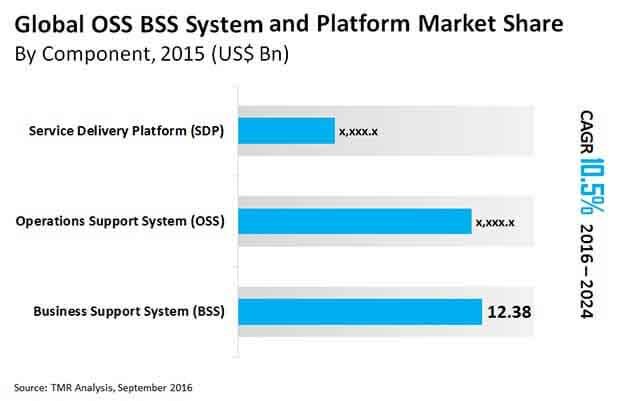 The OSS BSS system and platform market report provides an analysis of the global OSS BSS system and platform market for the period 2014 – 2024, wherein 2014 is the base year and the period from 2016 to 2024 is the forecast period. Data for 2014 has been included as historical information. The report covers all the prevalent trends playing a major role in the growth of the OSS BSS system and platform market over the forecast period. It also highlights various drivers, restraints, and opportunities expected to influence the market growth during the said period. The study provides a holistic perspective on market growth, throughout the above forecast period in terms of revenue estimates (in US$ Bn), across different geographies, which include North America, Europe, Asia Pacific (APAC), Middle East & Africa (MEA) and South America. The report provides cross-sectional analysis of the global OSS BSS system and platform market in terms of market estimates and forecasts for all the segments across different geographic regions. This research report provides in-depth analysis of the global OSS BSS system and platform market on the basis components and geography. The report also includes competitive profiling of major players engaged in providing OSS BSS and service delivery platform. Major business strategies adopted by them, their market positioning, and various recent developments have also been identified in the research report. This report also provides market positioning analysis of major players operating in the OSS BSS system and platform market. OSS refers to a set of programs designed to control the communications network by monitoring, analyzing, and managing several factors that govern the quality of services. These factors include the availability, reliability, and security of the services being offered. BSS refers to the solutions deployed by communication service providers in order to execute the business operations headed for their customers. The demand for BSS solutions is not limited to the communication industry alone but spreads across the retail industry, media and entertainment industry, and banks and financial institutes. Service delivery platforms (SDPs) incorporate many OSS/BSS specialties and provide a consolidated view of subscriber data, service configuration, and device-level information, strengthening every link in the service fulfillment chain. Furthermore, SDPs enable content providers to do valuable and worthwhile business with an operator by developing Web services and service-oriented architecture (SOA) into the operator's infrastructure. This research study on the global OSS BSS system and platform market provides a detailed analysis of various components and their respective applications. The report also offers an in-depth analysis of various factors such as market drivers, restraints, and growth opportunities affecting the market dynamics. These factors enable the analysis of various trends that would impact the market during the forecast period from 2016 to 2024. The report includes a comprehensive coverage of the underlying economic and technological factors under key trend analysis influencing the OSS BSS system and platform market. The report includes a comprehensive coverage of the underlying economic and technological factors under key trend analysis influencing the OSS BSS system and platform market. Furthermore, the report aims to provide strategic insights about the company’s strategies and developments through SWOT analysis in the OSS BSS system and platform market. The market positioning analysis of key players throws light on the prevalent competition in this market. Some of the key industry players profiled in the research study include Accenture Plc, Telefonaktiebolaget LM Ericsson, IBM Corporation, Amdocs Ltd., Tata Consultancy Services Limited, CSG Systems International, Inc., Oracle Corporation and Hewlett-Packard Company.